West Kelowna Wine Tours is proud to partner with Valhalla Helicopters to offer a UNIQUE Winery, Wedding & Heli Special Occasion Tour! 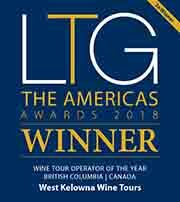 West Kelowna Wine Tours was recognized in 2017 as Luxury Travel Guide Global Wine Tour Operator of the year in London England. West Kelowna Wine Tours has successfully operated hundreds of wine tours in the past few years, showcasing the Okanagan's finest wine tours and wine tastings. Visiting Okanagan Wineries from Vernon's Sparkling Hills through to Kelowna & West Kelowna, we tour wineries on Naramata Bench, Oliver & Osoyoos.